Colton Leonard built a massive frame by mixing strongman training with gym routines. Check out his training regimen to see how strongmen haul loads! Muscle makes humans move. The more muscle you have, the more weight you can move. 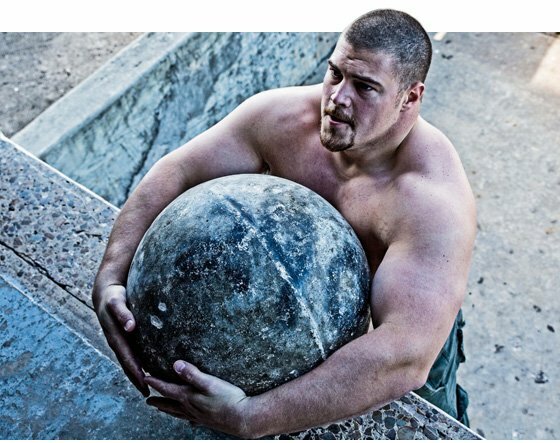 Strongman of Colton Leonard's ilk must maintain both strength training and strongman principles in order to dominate their sport's unique events. Leonard operates in both realms, dominating Olympic lifts, then carrying massive objects for distance and time, all under the intense scrutiny of gravity. He is up every morning at 5:15 a.m., when he heads to the gym. His packed day puts him to bed by 10 p.m. In between, he trains like only the strongest of men dare. His training is straightforward, and his philosophy can be applied to anyone in any sport: You will receive what you put in. If you put forth your best effort, regardless of other factors—genetics, metabolic rate—you will progress. 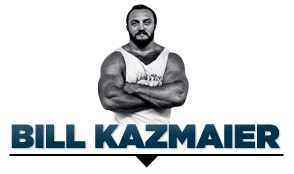 Bill Kazmaier actually had other people load up his bar between sets. This way he could mentally envision that the bar weighed the same as it did the set before; he didn't feel the extra weight being added. Then he attacked the set knowing he could complete the lift, just as he did the set before. "The second most important aspect is intensity, especially with strength training," Leonard says. "Your mind is far stronger than your body. Before you step foot into a training session, be mentally prepared and reminded of your goals. Mentally and physically attack each set. Each and every training session should reflect how badly you want to achieve your goal." Colton has a nine-day rotation. He goes two days on, then one day off, to allow him time to recover. "Strongman is high-intensity exercise, and if you do not take some time off once in a while, you will burn out fast and your body won't be able to keep up," Leonard says. Leonard utilizes several types of workouts. Some are similar like something you would do in a gym, or involve Olympic lifting. He may toss in one strongman event at the end of that workout, either for cardio or for strength purposes. He also has a normal gym training day, where he will go in, do a chest workout, get a great pump, add in some conditioning in at the end, and be done. But he also has days strictly for strongman event training. "Each day, each workout, I try to focus on three different levels," Leonard says. "I begin my workout with a strength movement. It can be one or two exercises, or even one using an implement, such as a log press. The next phase is hypertrophy. I bring in some of the bodybuilding-type movements because I want to maintain my size. The third part is conditioning, either hopping on a treadmill and knocking out 20-30 minutes of steady-state cardio a couple of times per week, or going outside and using implements at a lighter weight for longer distances for more high-intensity type cardio." 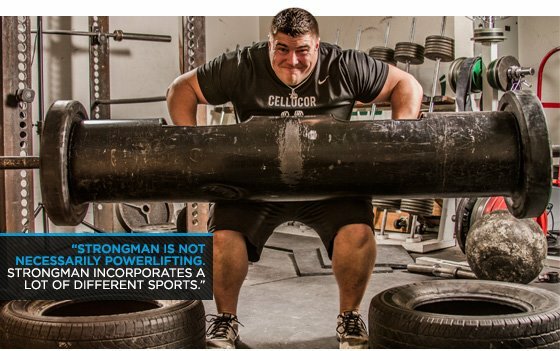 Strongman is not powerlifting. In powerlifting, your competitive focus is on three movements, and then you can go home. Strongman is more unpredictable, and it incorporates a lot of different sports. You have to be big, strong, athletic, and with serious endurance to boot. Colton still incorporates a lot of bodybuilding-style isolation movements in his routine. He knows that high-level competitors have to to maintain size as well as strength to excel in strongman. "My personal best is the atlas stones," Leonard says. "The sport is known for this event. My personal record is to lift a 400-pound stone in consecutive lifts in competition. I placed fourth at the Strongman Texas competition. I made a few rookie mistakes that dropped me down a little bit, but I was the only one in Texas to load the 385-pound stone. I take pride in that and really enjoy the stones." Strongman competition is for, well, strong men, but the events can be performed by lifters at any level. You just have to lower the weight or lift a smaller apparatus. The events challenge strength, for sure, but they are also unparalleled for building muscular endurance. "I am a big believer in using some of the movements for conditioning," Leonard says. "If you're just an average gym-goer and you just train to get a little bigger and a little leaner, I highly recommend you pick up a heavy object and carry it for a distance. See how you feel afterward. Do it after a workout. It changed the way I train." Colton said he plans to get back into bodybuilding at some point in the future. But when he does, he'll take strongman with him, in the form of movements like the farmer's walk. He insists that loaded carries are keys to his amazing strength and conditioning. This workout is not for the weak of heart! But remember, you can do it, no matter who you are. Just realize that you cannot lift many of these objects, and definitely not in the way Leonard does. Emphasize progress! "The more I can get my hands on the actual event objects prior to a contest, the more familiar I am with them come the day of the contest," Leonard says. "I work everything down to the transitions from one object to another and proper foot placement." 2 warm-up sets of 500 lbs. ; 2 sets of 700; one set with 850. Weight is carried 80 ft.
1 warm-up set; 2 working sets with 300 lbs. Warm-up with lightest stone; 1 set of a stone runs (loading 5 stones for fastest time) 1 set of max reps with 330-lb. stone or 285 stone. Bellow is Colton's training when he is not preparing for a contest. This style of training helps him focus more on building maximal gym strength in the main movements: squat, deadlift, bench press, and overhead press. "The training is different because I am always training to get stronger; that starts with strong gym movements," Leonard said. "The months before a contest, I am likely not going to set to many PRs in those lifts. My focus is on implements that will be used in a contest. 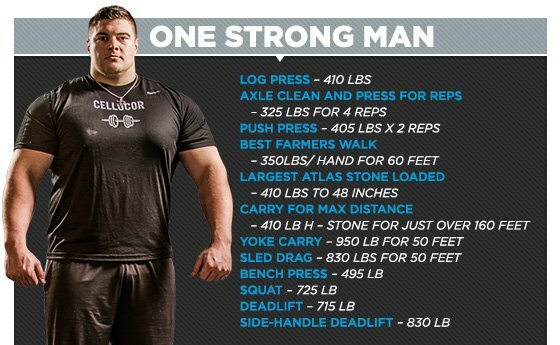 I recommend any lifters getting started in strongman to follow a template similar to the one below." Extras: I leave room here for 1-2 additional exercises I'd like to do that week. For example: Side raises, rear delts, more biceps work, calves etc. Day 6: Strong Man Saturday! 2-4 strongman events preparing for the next contest I have. I alternate between using lighter weight for speed and time for several runs and 1-2 maximum effort sets.